With 15 000 students, a rich and multidisciplinary training offer and 19 research labs recognized at the international level, the Savoie Mont Blanc University (Chambéry) is a human-sized establishment that combines proximity with its territories and a wide openness to Europe and the world. Between Geneva, Turin, Lyon and Grenoble, at the borders of Switzerland and Italy, with the unwavering support of the communities that saw it born, it is a territorial, regional and cross-border actor, a major player in social, economic and Cultural. It proposes short courses (university diplomas, academic degrees of technology) and long (licences, masters, doctorates and also diplomas of engineers), whether in initial training, in continuous training, alternating or in validation of Experience acquired (VAE), on-site or remotely. On its three campuses, Annecy, Le Bourget-du-Lac and Jacob-Bellecombette, Savoie Mont Blanc University offers particularly attractive conditions of study at the heart of an exceptional environment. Everywhere, in this structured multipolarity, students find a personalised follow-up, an accompaniment in the definition and evolution of their personal projects and the strengths to succeed their insertion in the working life. Each and every one will appreciate, in his quest and according to his paths, competence, requirement, relevance, recognition and resonance. Savoie Mont Blanc University has been able to forge close and constructive links with local, regional and other socio-economic actors, which today make it an indispensable element of the Rhone dynamic. The research is carried out by recognised laboratories, labelled and distinguished, actors of close partnerships with large organisations (CNRS, CEA, INRA), international organisations (CERN) or other structures (INES, Institut de la Montagne) also at the forefront of innovation. Our researchers are strongly involved in a few areas that accompany the territorial Dynamics: mountain, mechatronics, the sectors of organizations, tourism, image and energy. With physics, they contribute to the visibility of the Savoie Mont Blanc University on niches where its notoriety is internationally recognized. Cultural entity, formation and creation of value (s) rooted in its history and federating, thanks to the woven cooperation, resources for today and for tomorrow, our University invests in the academic excellence of its trainings multidisciplinary, personalised coaching, quality research, innovation, openness to the world and international exchanges, infrastructures, cultural and associative vitality, this, for the only cause that is worth, which is the human being. 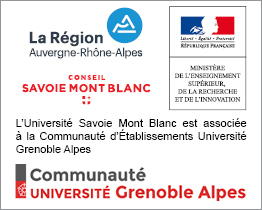 Through the commitment and mobilization of all its personnel, between Savoie and Mont-Blanc, the University nourishes its efforts with one ambition: to strive for personal success and to contribute to the best insertion of its students in the society of knowledge of the 21st century.